Image courtesy of Meet the Serbs on Facebook. 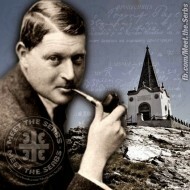 Rudolph Archibald Reiss was born on July 8, 1875 near Hausach, Germany. After finishing secondary school, he went to Switzerland, to study at the University of Lausanne. Reiss became a Ph.D in Chemistry at the age of 22, and taught photography at the university. He became a tenured professor of forensic science in 1906, and in 1909 established the “Institut de police scientifique” (Institute of scientific policing). His first major scientific book, “Photographie judiciaire” (Forensic photography), was published in Paris in 1903. Only the first volume (Vols et homicides – Thefts and Homicides) of his planned magnum opus, ”Manuel de police scientifique” (Manual of Forensic Science) was completed and published prior to the Great War, in 1911. As a world-renowned criminologist, Dr. Reiss was invited by the Serbian government in 1914, to investigate the crimes of Austro-Hungarian invaders against the Serbian civilians. He wrote detailed reports of the atrocities, many of which were published by the Swiss news journal “Gazette”. Dr Reiss also took more than 100,000 photographs, which are currently being digitized by Eric Sapin from the University of Lausanne. In 1915, Dr. Reiss retreats with the Serbian Army (and many civilians) across Albania, witnessing the ordeal firsthand. Later, he would march with the Morava Division as it liberated Belgrade in 1918, and would be a member of the Serbian delegation at the peace talks in Versailles. After the war he stayed to live in Belgrade, proposing improvements to the police and the Red Cross. He was recognized as a honorary citizen by the town of Krupanj in 1926 – the same year the Kingdom of Serbs, Croats and Slovenes awarded Dr. Reiss a honorary commission as Infantry Captain First Class. However, Reiss was bitterly disappointed in the petty power politics of postwar Belgrade, and contemplated heading back to Switzerland. This prompted him to write “Ecoutez les Serbes!”, his political testament, in the summer of 1928. Unfortunately, the manuscript remained forgotten until 1997. R. Archibald Reiss died on August 8, 1929 in Belgrade. He was buried at the Topčider cemetery, while his heart was placed in an urn and interred at the monument to Serbian heroes at Mt. Kajmakčalan, site of the bloody 1916 battle that later enabled the victory on the Salonica Front. It [the Urn] was destroyed by the Bulgarian invaders during World War Two. The Reiss Institute for Serbian Studies was established in December 2013, with the principal mission of challenging the fictions, fabrications and fantasies that have caused so much suffering and violence in the Balkans over the course the 20th century. We named it after Rudolph Archibald Reiss, a German-born Swiss forensic scientist, who in 1914 came to Serbia to investigate the atrocities of the Austro-Hungarian invaders. Moved by what he saw, he settled in Serbia after the war and helped organize the Red Cross and modernize the police.